I played the Scottish Highland bagpipes this morning during the graveside service of Norman McRae at Desert Lawn Memorial Park in Kennewick, Washington. Highland Cathedral, Going Home, and Hector The Hero were played during the service. MacNeil of Barra was the tartan of the day. I piped in the graduates this morning, on the Scottish Highland bagpipes, to start the Hanford Patrol Tactical Response Team Graduation at the Battelle Auditorium in Richland, WA. MacNeil of Barra was the tartan of the day. I played the Scottish Highland bagpipes this morning during the Ceremony of Life for Lee "Swede" Pace at Cloverleaf Hall in Enterprise, Oregon. Hector The Hero was played, among other tunes. MacNeil of Barra was the tartan of the day. I played the Scottish Highland bagpipes this afternoon during the graveside service of Elsie McQuerry at Tahoma Cemetery in Yakima, Washington. 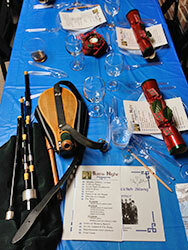 Suo Gan, Return From Glengarry, and Going Home were played before the service. The service concluded with Amazing Grace and Highland Cathedral. MacNeil of Barra was the tartan of the day. I played many tunes on the Scottish Highland bagpipes this afternoon during the wake for Eric Dunham at Balboa Winery in Walla Walla, Washington. MacNeil of Barra was the tartan of the day. I played a few pre-service tunes on the Scottish Highland bagpipes and then Amazing Grace and Highland Cathedral during the funeral of Jack Lockett this afternoon at Langevin El Paraiso Funeral Home in Yakima, Washington. MacNeil of Barra was the tartan of the day. Wearing the MacNeil of Barra tartan, I played several tunes on Scottish Highland bagpipes and smallpipes this evening at a family reunion northeast of Walla Walla, Washington. 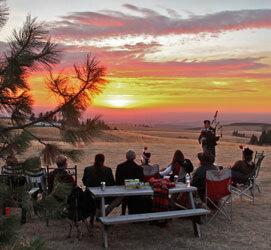 Highland pipes were played on the ridge at sunset, with smallpipes indoors afterward. Dancing and singing by the family rounded out the evening. 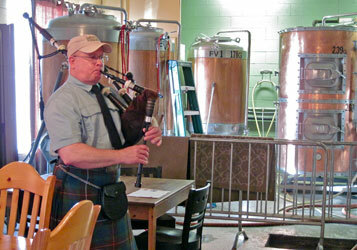 I played a few tunes on Scottish smallpipes at Bootlegger's Cove Bar & Grill in Tieton, Washington today. I was up there to see Celtic band Carrigaline. 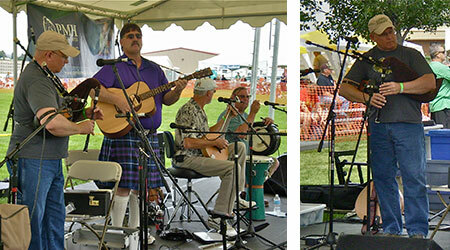 I played Scottish Border bagpipes, tenor mandola, and whistles today with Celtic band Skweez The Weezle at the 18th annual Tumbleweed Music Festival in Richland, Washington. 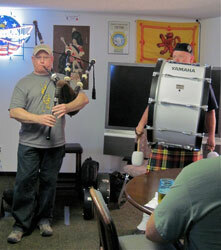 I played Scottish Border bagpipes, tenor mandola, and whistles today with Celtic band Skweez The Weezle at Bootlegger's Cove Bar & Grill in Tieton, Washington. 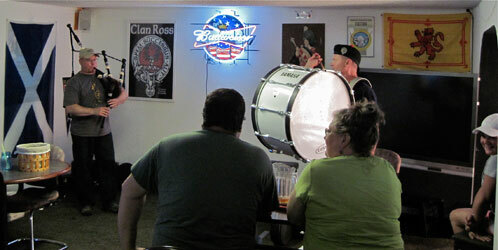 After the gig I played Scottish Highland bagpipes with my friend Larry Buchanan of Highland Pipes and Drums on bass drum. 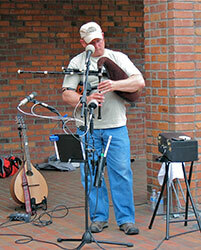 I played a few tunes on Scottish smallpipes at Bootlegger's Cove Bar & Grill in Tieton, Washington today. I was up there to do reconnaissance for Skweez The Weezle's gig there on August 23, 2014. I played When The Saints Go Marching In on the Scottish Highland bagpipes this morning for the recessional march during the funeral of Anthony Steiger at St. Joseph Catholic Church in Kennewick, Washington. MacNeil of Barra was the tartan of the day. 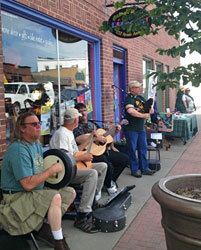 I played Scottish Border bagpipes and whistles today with Celtic band Skweez The Weezle at Benton City Daze in Benton City, Washington. The rain held off for the most part. We did play through some huge raindrops during our An Dro set. I played Scottish Border bagpipes, tenor mandola, and whistles today with Celtic band Skweez The Weezle at the Caledonian Games in Athena, Oregon. 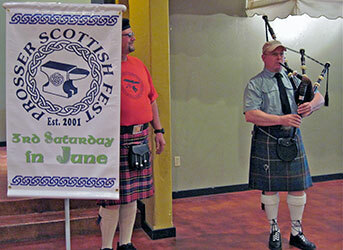 Wearing the MacNeil of Barra tartan, I played Scottish Highland bagpipes for the Order of the Eastern Star installation of officers at the Yakima Valley Sundome in Yakima, Washington. Scotland The Brave and Murdo’s Wedding were played to bring the new officers in. 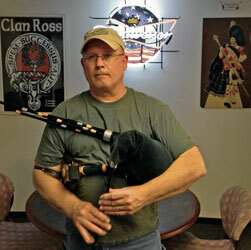 Lord Lovat’s Lament and Loch Ruan were played for the parting marches. I played Scottish Border bagpipes, tenor mandola, and whistles today with Celtic band Skweez The Weezle at the 14th annual Prosser Scottish Fest and Highland Games in Prosser, Washington. 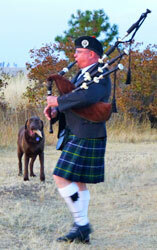 Wearing the MacNeil of Barra tartan, I played Scottish Highland bagpipes for The Scottish Deerhound Club of America's National Specialty today at Howard Amon Park in Richland, Washington. The prelude tune was Hector The Hero. Mustering tunes were Scotland The Brave and Murdo’s Wedding. 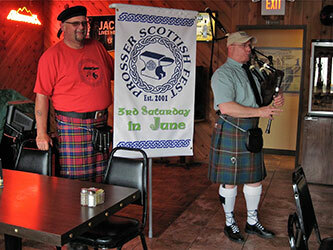 Parade of Champions tunes were Lord Lovat’s Lament, Loch Ruan, and Return From Glengarry. Wearing the MacNeil of Barra tartan, I played Scottish Highland bagpipes today for Liz and Simon’s wedding at Shadow Lake Ranch north of Prosser, Washington. Processional march Return From Glengarry brought the grandmothers to their seats. 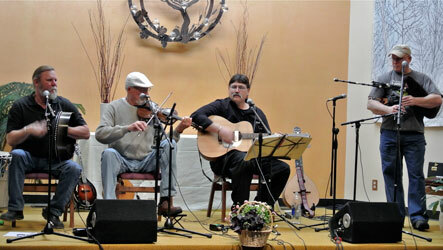 A selection of jigs, reels, and marches was played while guests were being seated for dinner. I played Scotland the Brave and Murdo’s Wedding to lead guests onto the field to view the anvil launch conducted by pyrotechnic wizard Wayne Pearson. Wearing the MacNeil of Barra tartan, I played Scottish Highland bagpipes today for Kathleen and Gary’s wedding at the lighthouse on Clover Island in Kennewick, Washington. Processional march Return From Glengarry brought Kathleen and her father to the alter. The jig Farewell To The Tay accompanied Kathleen and Gary during the recessional. 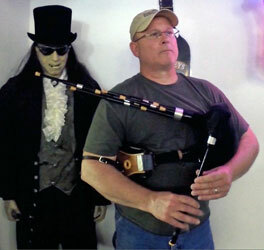 I played Scottish Border bagpipes, tenor mandola, and whistles this evening with Celtic band Skweez The Weezle at Pizzazz! 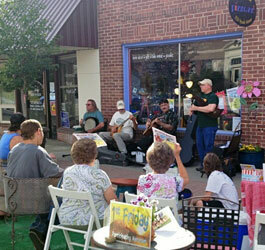 (see photos) and Horse Heaven Saloon during Prosser’s 1st Friday event. 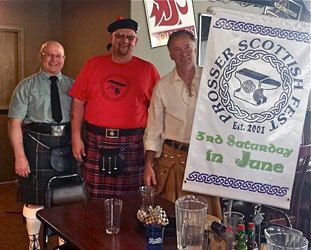 We were helping to raise awareness of the Prosser Scottish Fest within Prosser, Washington. I played Scotland The Brave and Amazing Grace on the Scottish Highland bagpipes this morning for the graveside service of Bill McCullough at Einan’s Sunset Memorial Gardens in Richland, Washington. MacNeil of Barra was the tartan of the day. I played Amazing Grace on the Scottish Highland bagpipes this afternoon for the memorial of Christopher Wollam at the Memories at Sunset Event Center in Richland, Washington. MacNeil of Barra was the tartan of the day. 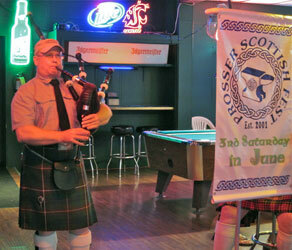 Wearing the Ancient Hunting Fraser tartan, I played this evening for another Prosser Scottish Fest pub crawl to raise awareness of the fest within Prosser, Washington. Local businesses that I played at were: The Pizza Stone & Pub, The Barn Restaurant, Princess Theater, El Caporal Restaurant, Horse Heaven Hills Brewery (see photos), Horse Heaven Saloon, and Bern’s Tavern. I played Amazing Grace, Highland Cathedral, the Marine Corps Hymn, and Going Home on Scottish Highland bagpipes for the memorial of Carlos Benjamin at West Side Church in Richland, Washington. MacNeil of Barra was the tartan of the day. I played Amazing Grace and Rakes of Mallow on the Scottish Highland bagpipes this afternoon for the memorial of Monsignor Desmond Patrick Dillon at St. Joseph Catholic Church in Kennewick, Washington. MacNeil of Barra was the tartan of the day. I played Amazing Grace and Highland Cathedral on the Scottish Highland bagpipes this afternoon for the memorial of Jack Frase at Columbia High School in Burbank, Washington. MacNeil of Barra was the tartan of the day. Wearing the MacNeil of Barra tartan, I played many Irish and Scottish tunes on the Scottish Highland bagpipes for the Murphy Clan family reunion and tree planting ceremony in Toppenish, Washington. I played Scottish Border bagpipes, tenor mandola, and whistle with Skweez The Weezle this afternoon at the 44th annual Whitman College Renaissance Faire in Walla Walla, Washington. Wearing the Ancient Hunting Fraser tartan, I played this evening for the Prosser Scottish Fest pub crawl to raise awareness of the fest within Prosser, Washington. Local businesses that I played at were: The Pizza Stone & Pub, The Barn, Horse Heaven Hills Brewery (see photos), Horse Heaven Saloon, and Bern’s Tavern. 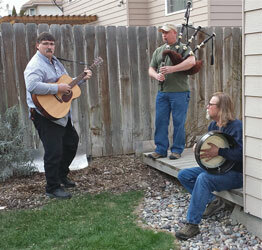 I played Scottish Highland bagpipes, Scottish Border bagpipes, and whistles this afternoon at a house party in Richland, Washington. 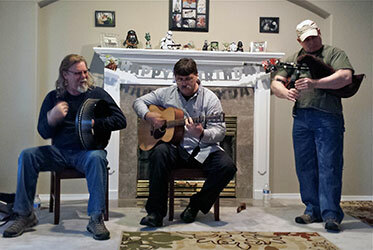 Troy Hanford and Mike Day of Celtic band Skweez The Weezle joined me for the tunes. We had a great time. 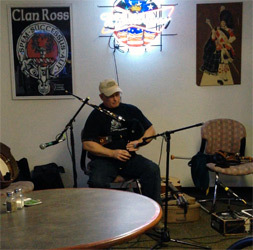 I played Scottish Border bagpipes, tenor mandola, and whistles this evening with Celtic band Skweez The Weezle at the Towne Crier Restaurant and Lounge in Richland, Washington. 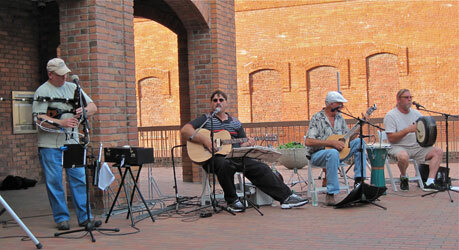 The Towne Crier hosted Thursday night Celtic Nights, with host band Skweez The Weezle, for many years. It’s always good to be back. 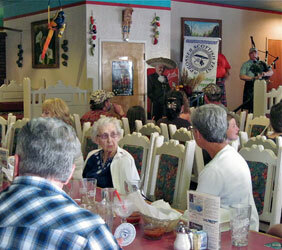 I played the Scottish Highland bagpipes this afternoon for Victor Marshall’s Celebration of Life at the Knights of Columbus hall in Richland, Washington. 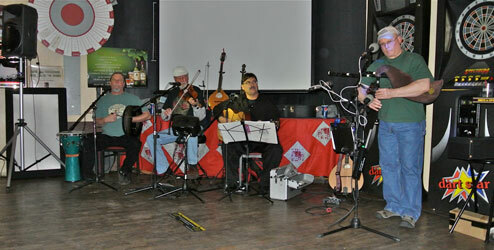 A selection of Irish themed tunes were played. MacNeil of Barra was the tartan of the day. 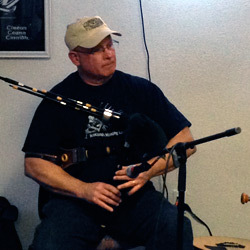 I played Scottish Border bagpipes, tenor mandola, and whistles this evening with Celtic band Skweez The Weezle for the Three Rivers Folklife Society’s Celtic Concert at the Community Unitarian Universalist Church in Pasco, Washington. 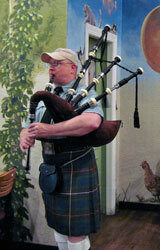 I played Scottish Border bagpipes, tenor mandola, and whistles with Celtic band Skweez The Weezle today at the Royal Columbian Retirement Inn in Kennewick, Washington. This was for their annual St. Patrick’s Day celebration. 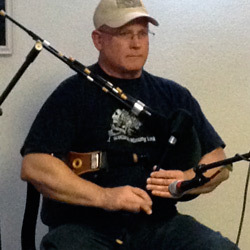 I played Scottish Border bagpipes, tenor mandola, and whistles with Celtic band Skweez The Weezle today at the Charbonneau Retirement Community in Richland, Washington. This was for their St. Patrick’s Day celebration. 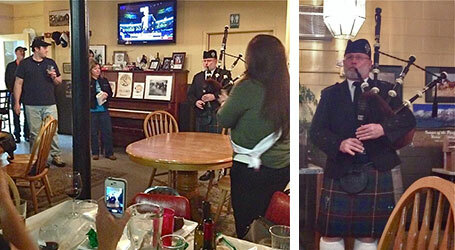 I played the Scottish Highland bagpipes and Scottish smallpipes, and a bit of tin whistle this evening at the Plung’s 3rd Annual Burn’s Night dinner in West Richland, Washington. I played Scottish Border bagpipes, tenor mandola, and whistles with Celtic band Skweez The Weezle today for the Benton-Franklin Humane Society’s 15th Annual Crab Feed, benefiting the homeless animals in the care of the Benton Franklin Humane Society in Kennewick, Washington. 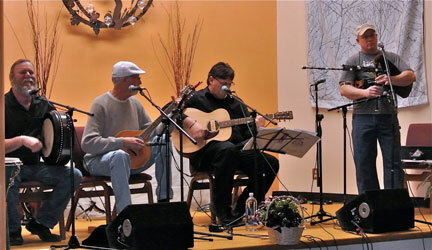 This fundraiser took place at Saint Joseph Catholic School in Kennewick.